What do you see when you think of Japan? 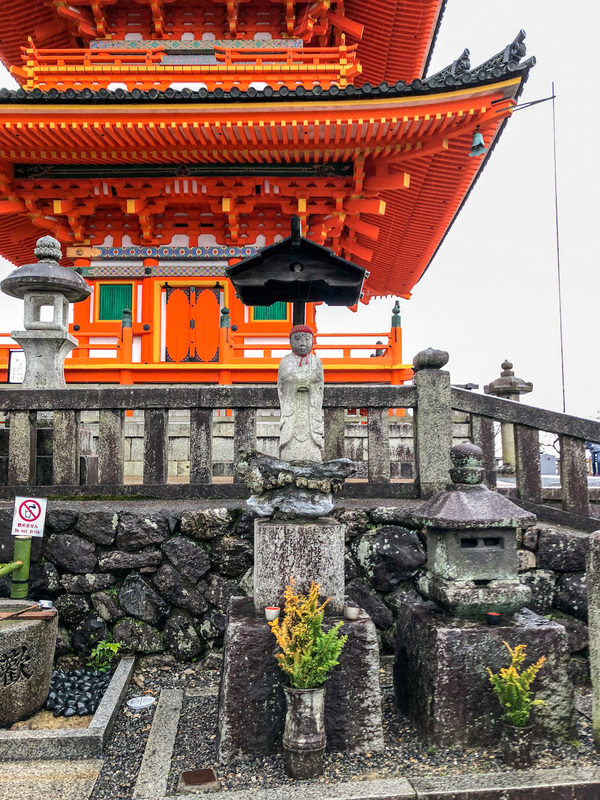 Is it typical pointy roofed houses, beautiful temples, tea ceremonies and geishas? 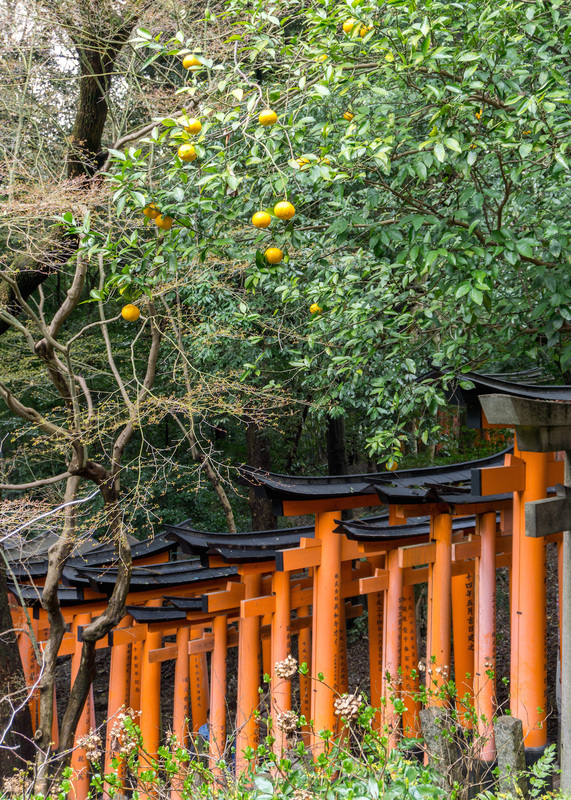 Is it a winding path lined by tall bamboo trees, and orange gates lined one after the other climbing up a hill? Or is it simply a big bowl of delicious, hot, slurpy ramen? If any of the above are true, you must take yourself to Kyoto. Of all the Japanese cities we visited, Kyoto is the most picturesque. 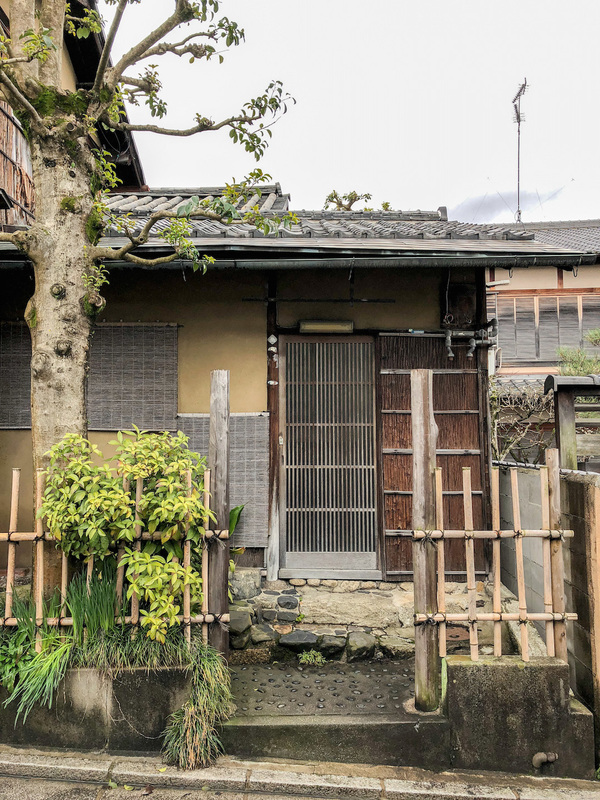 The olden style of Japan is still very visible, especially in Higashiyama, the historic district. 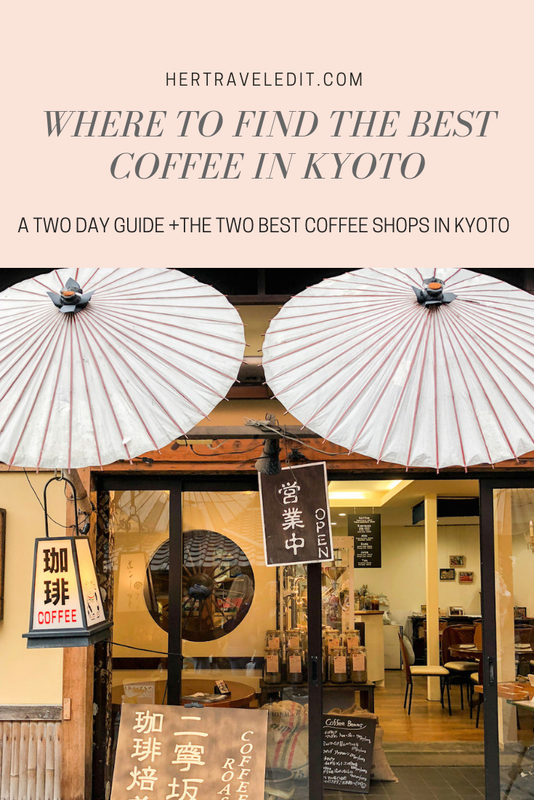 Here’s an ideal two day Kyoto itinerary. 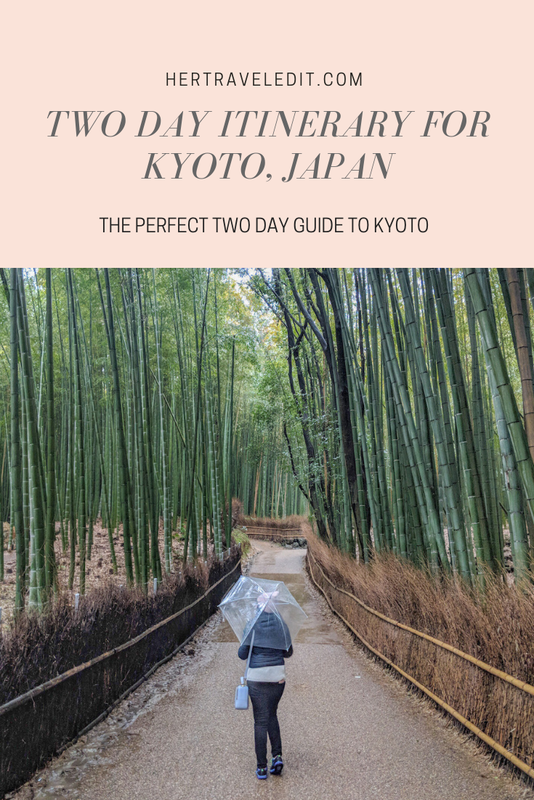 I’d like to preface it with a warning that you should plan for at least three or four days in Kyoto, not counting the day trips you would want to take. Don’t say I didn’t warn you. 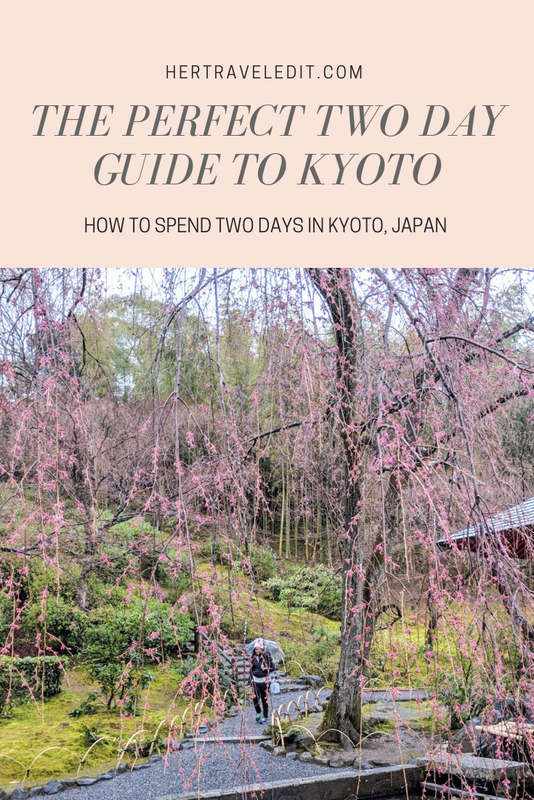 You will fall in love with Kyoto, and two days will definitely seem much too short. 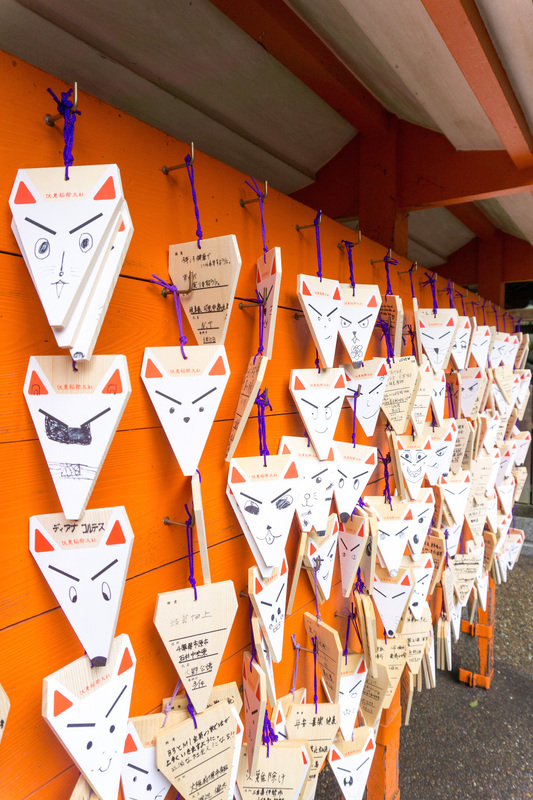 Start your day at Fushimi Inari. 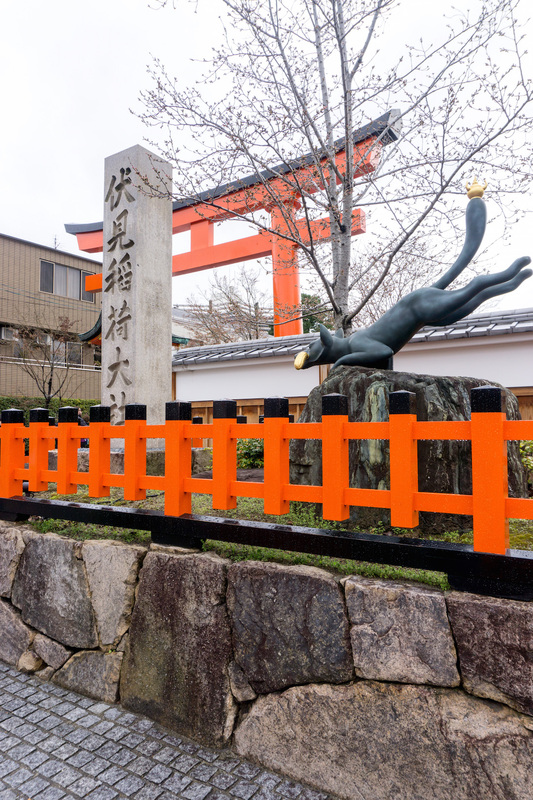 Fushimi Inari is the shrine of the God of Rice, also worshipped as the patron of business. Business men donate tori gates to bring good luck to their business. The bigger your donation, the bigger your gate! 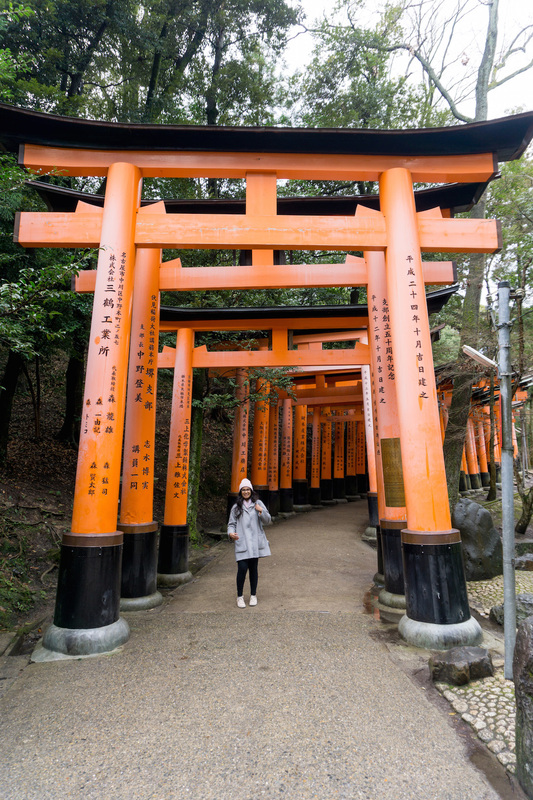 You probably recognize Fushimi Inari, there are countless pictures of it floating around on the internet. So thats why you must get there before 8 am. 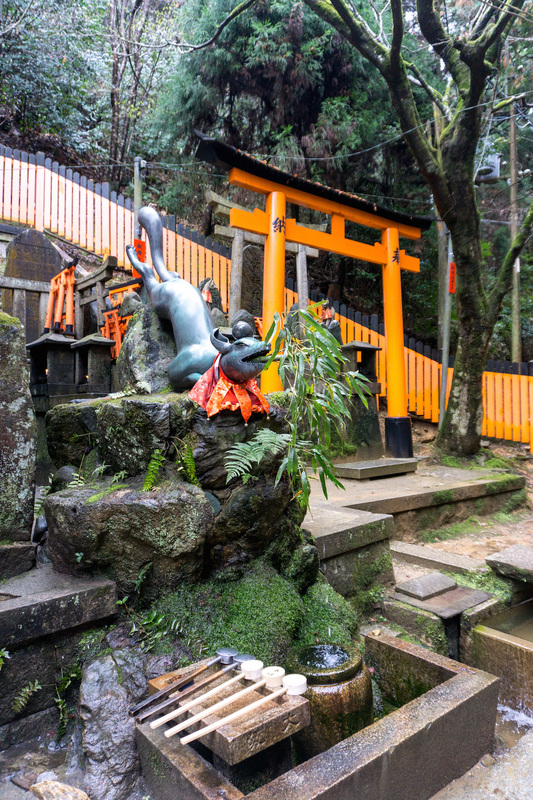 What you may not realize from the pictures is that the Fushimi Inari gates continue all the way up the hill. I highly recommend you follow these gates and ‘hike’ up (it’s really a very easy hike). 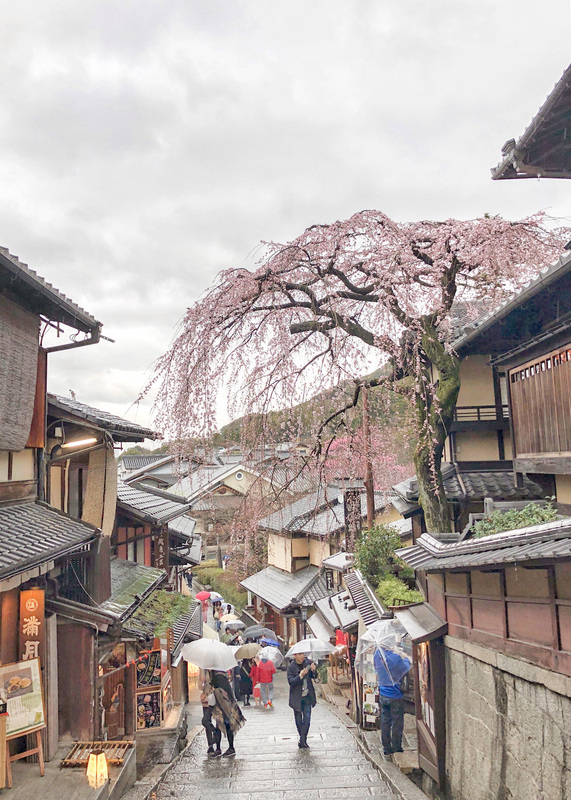 Crowds get much thinner as you go up, and you can also enjoy some fabulous views over Kyoto! There’s not much to see beyond the view point, but if you have time definitely complete the hike! There is a cool little shrine at the top too! I loved the theme of foxes throughout the hike. Some of the statues were so cute! 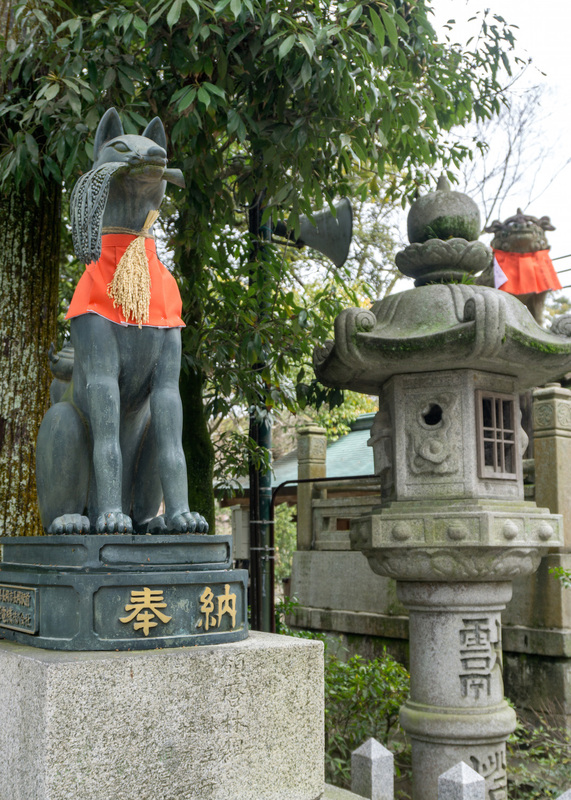 Foxes are thought to be Inari’s messengers, and a few of the statues have keys for the rice granary in their mouth. On the way down, take the non Tori path. 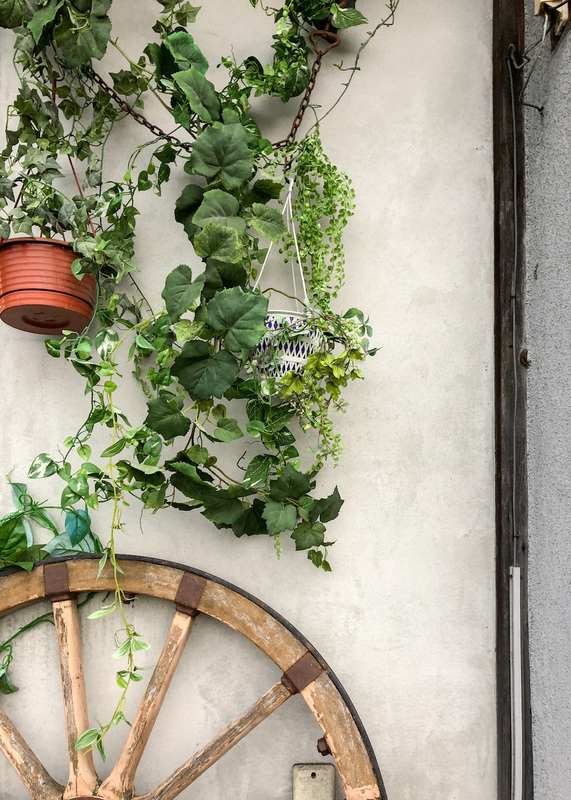 This will lead you to a cute little cafe for a coffee and breakfast reward. 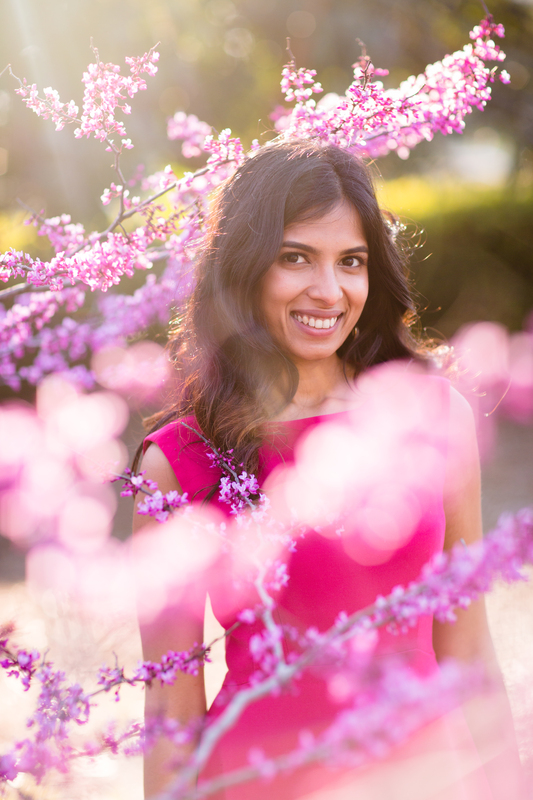 Everything was so pretty in early Spring, the cherry blossoms had just started to bloom! 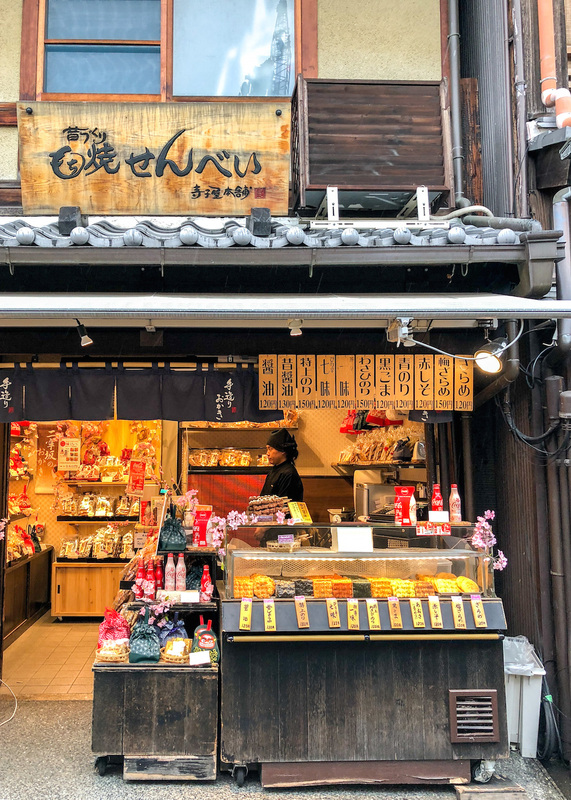 Spend your afternoon exploring the old town of Kyoto. This is the essence of Kyoto, probably the reason that you added Kyoto to your Japan itinerary in the first place. 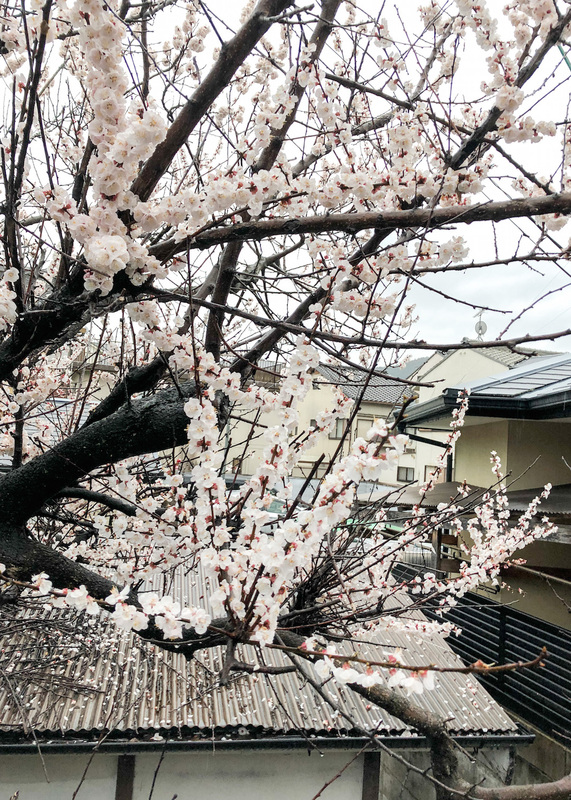 The district, Higashiyama, is one of the most preserved districts in Kyoto. I loved walking past the wooden houses, imagining I was traveling back in time! 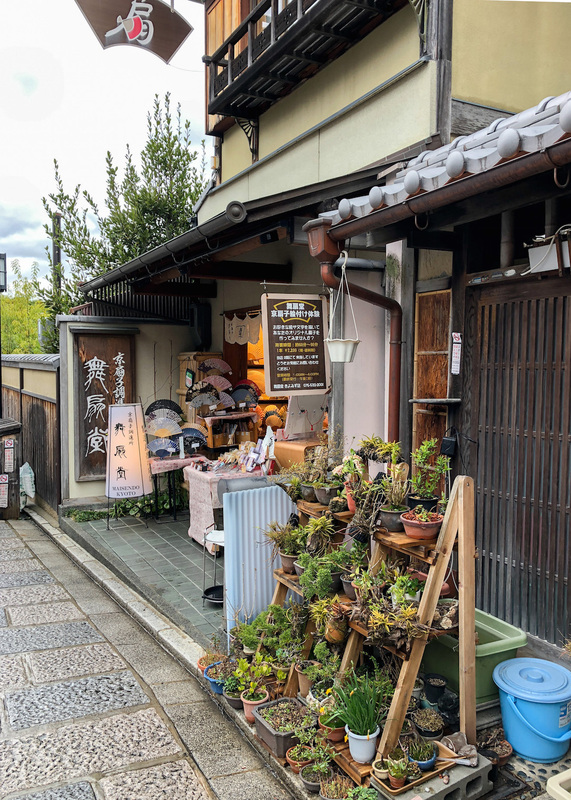 One of the most popular areas to walk in Higashiyama are Ninenzaka and Sannenzaka. When I say popular, I mean expect it to feel a bit like Disneyland. The place was packed! However, it is still fun, and you can always wander off to the little alleys and immediately lose the crowds. We stumbled upon a cute little coffee shop while looking for a place to hide from the rain. It’s called the Ninenzaka Cafe Garakuta and is now one of my favorite coffee shops in the world! Everyone there was so friendly, they roast their own coffee which is amazing, and they had a cute little pet West Highland terrier! 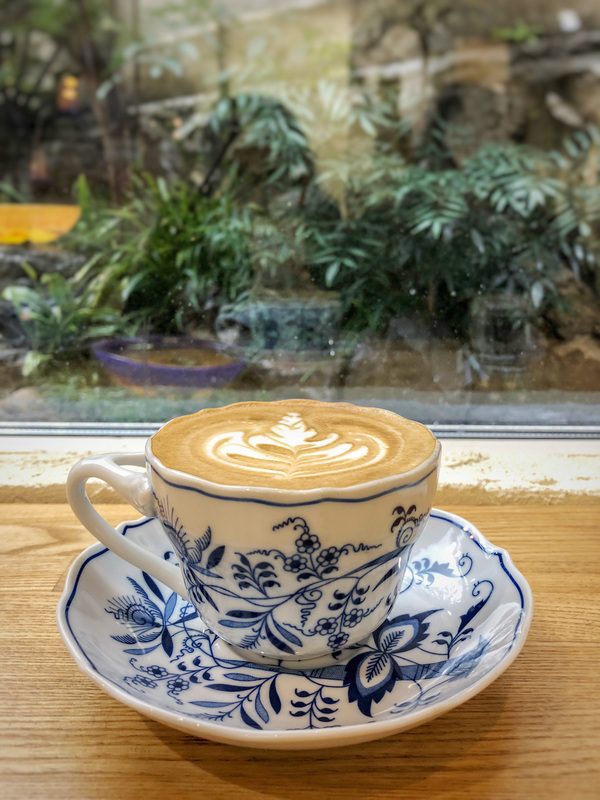 We spent a lovely afternoon there, sipping our hot cappuccinos while looking at the rain splatter on to the little rock garden outside. Totally zen! Dressing up in a kimono and / or pretending to be a geisha seems to be a popular activity here. So if you think you spotted a Geisha – sorry to burst your bubble, but she’s probably not actually one! There are also a lot of fun shops here and loads of little snack places. I loved eating all matcha everything! So delicious! While you are here, there are two temples at either end of the walk. At the bottom is the Hokanji temple, whose Yasaka Shrine you can see in the picture below. 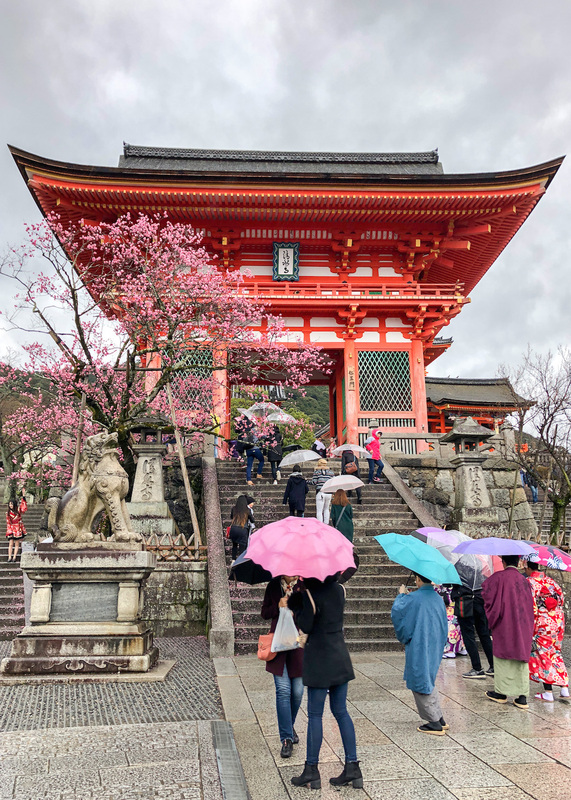 At the top is Kiyomizu-dera, a very photogenic orange temple. We didn’t actually go inside either of them, but they are so pretty even from the outside! One thing I would highly recommend against doing is visiting any sort of Animal Cafe. You can never know if the animals are treated well. It is very cruel to some animals to be shown off and forced to interact in that way. This area closes down around 6 pm, which is a blessing. We went there in the evening, and it was empty. I definitely recommend hanging out at the base of Kiyomizu-dera temple or near Hokanji temple around sunset, then going on a romantic post sunset stroll. You won’t find many restaurants open here after dark however. 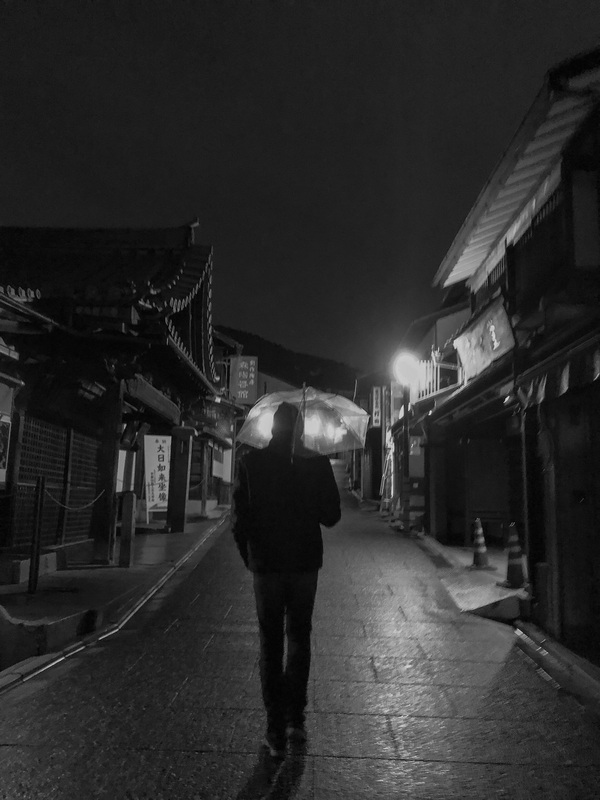 Another interesting place is the Gion district. 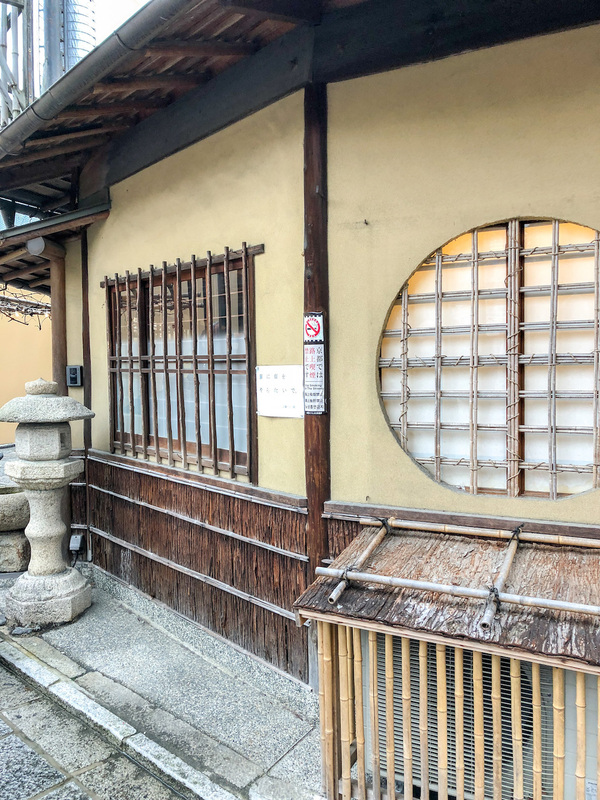 This is where you might spot a Geisha, or could indulge in a Japanese tea ceremony! There are also a lot of wonderful places to eat here. In the evening, I’d like to suggest something a bit unconventional. I know you went to Kyoto to see old Japan, but modern Kyoto is pretty cool too! Spend some time exploring Kyoto Station. This ten floor station is almost like its own city! The modern building is a stark contrast to the old Kyoto, but it was specifically designed to convey historical Kyoto in a modern context. 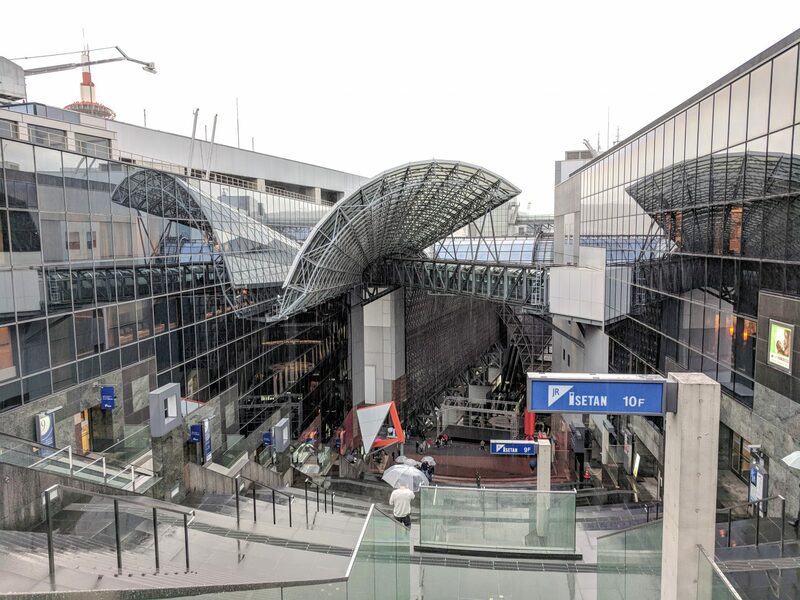 You could easily spend the entire day exploring Kyoto Station. 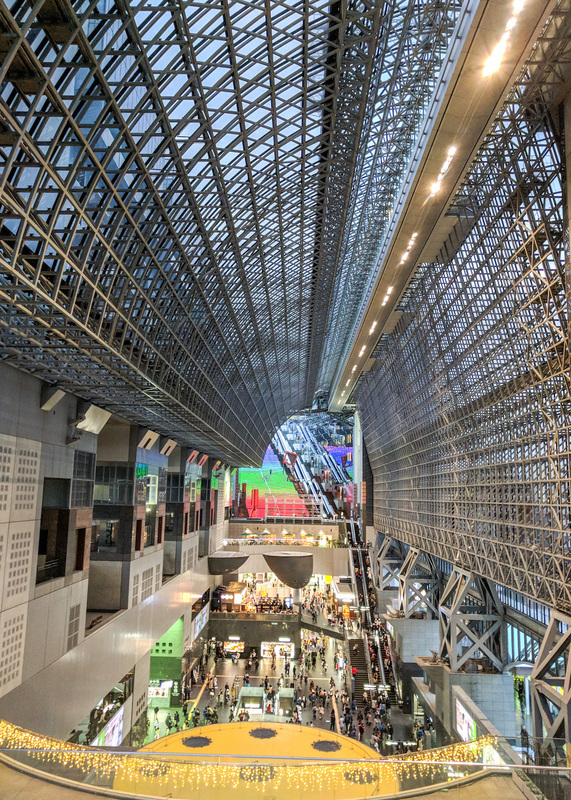 Our friends Alan and Ashley spent a rainy afternoon scoping out the best of Kyoto Station and they recommend going up to the tenth floor observation deck to see the views! Thank you to them for sharing the next couple of pictures! On their recommendation, we also tried and loved Ramen Street on the 10th floor! It’s basically a food court with different types of Ramen from all over Japan. I know you don’t have the whole day, but you’ll need at least a couple of hours to explore all the shops and restaurants (petite girls, if you are reading, there are so many clothing boutiques here!). The station gets quite bewildering and getting lost is almost guaranteed. 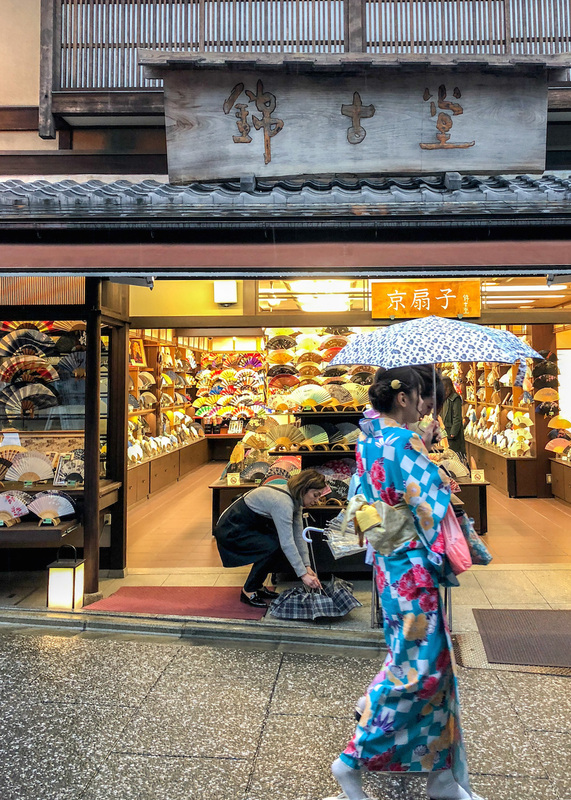 Time also passes differently here, on the one hand are passengers rushing to catch their trains, on the other, people slowly savoring the best of food and delicacies that Kyoto has to offer. Start Day 2 early again, this time at the Arashiyama Bamboo Grove! If you are staying in Kyoto, it will take about 45 minutes to get to Arashiyama. If you don’t like sharing your bamboo groves with crowds, it’s best to get there by 7 am. 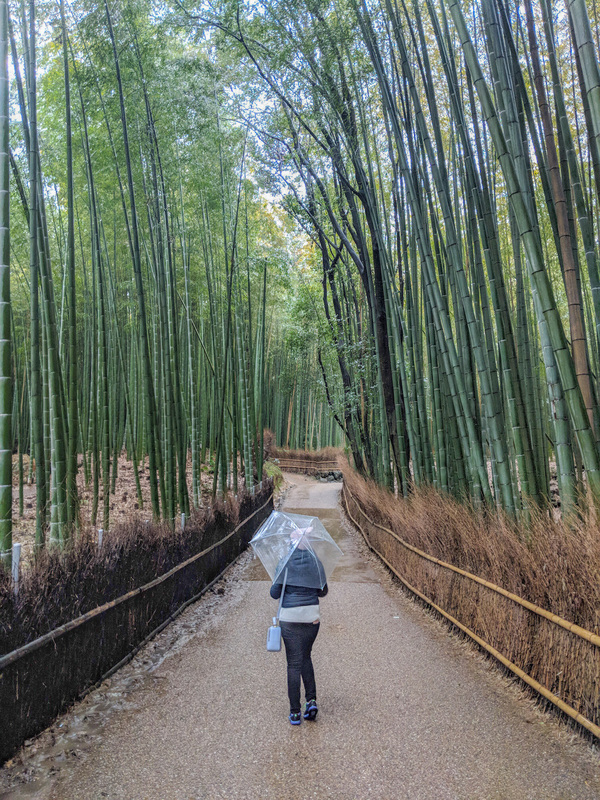 The Arashiyama Bamboo Grove is a short, pretty walk from the JR Saga-Arashiyama train station. 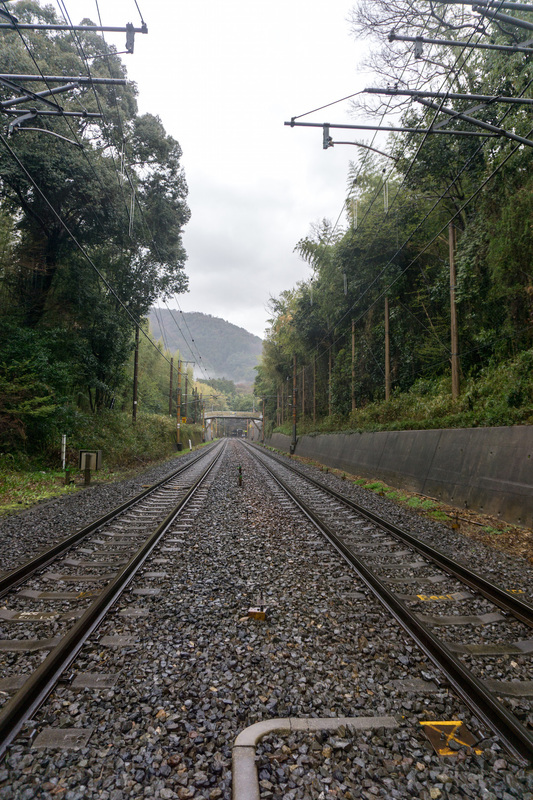 Since you are there very early, you should definitely walk a little past the grove, past these train tracks and on to some other, less-frequented bamboo groves. The Bamboo Grove itself is beautiful! It’s so serene to walk through it early in the morning. It was pouring when we went, and the sound of the rain made it even more beautiful. The Japanese have a term ‘Shirin-Yoku’ which translates to forest bathing and literally means healing yourself by taking a walk in a forest. Such a beautiful concept! 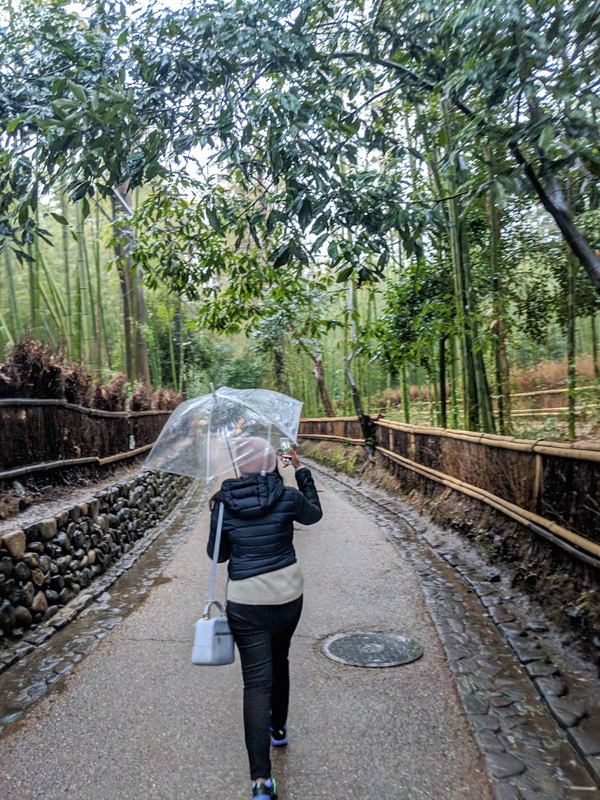 An early morning walk in the Bamboo Grove would definitely contribute to Shirin-Yoku. 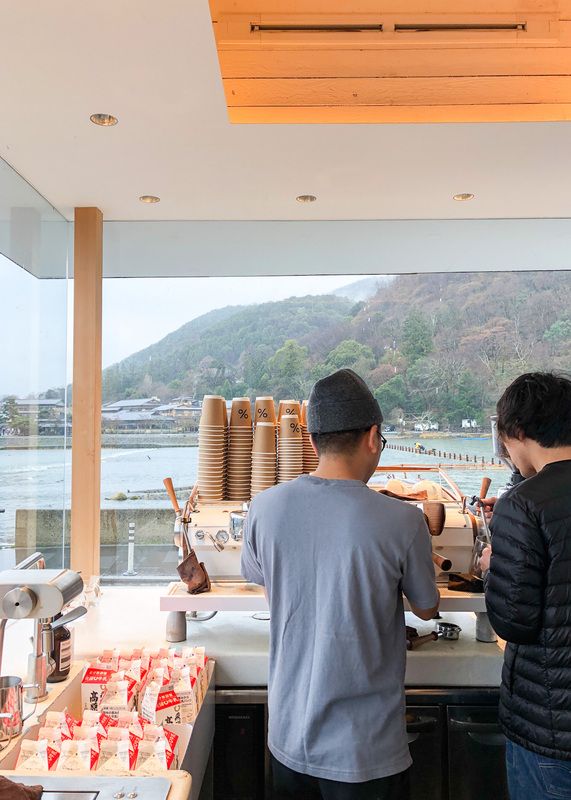 Once you have had your fill of the Bamboo Grove (and hundreds of other tourists have started trickling in), treat yourself to some coffee. 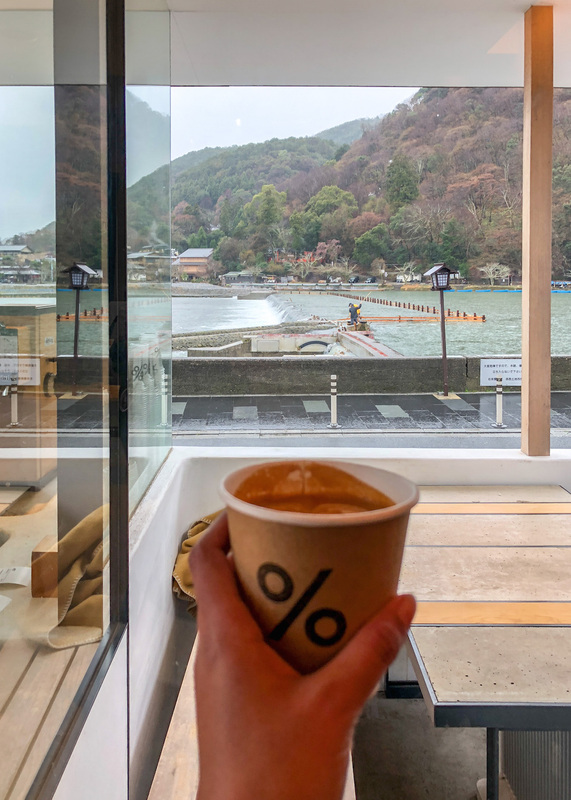 The Japanese make great coffee and espresso, and one of my favorites was % Arabica in Arashiyama. The location is stunning, overlooking the Arashiyama mountain and river. It is a tiny coffee shop so go as soon as it opens, but you can book the private room there if you are in a group. If you like monkeys, you could then head to the Iwatayama Monkey Park. I’m not a huge fan of monkeys after being scratched by one when I was a kid, so I didn’t go. But my friends went (one was even interviewed for a Japanese TV show!) and they had so much fun! 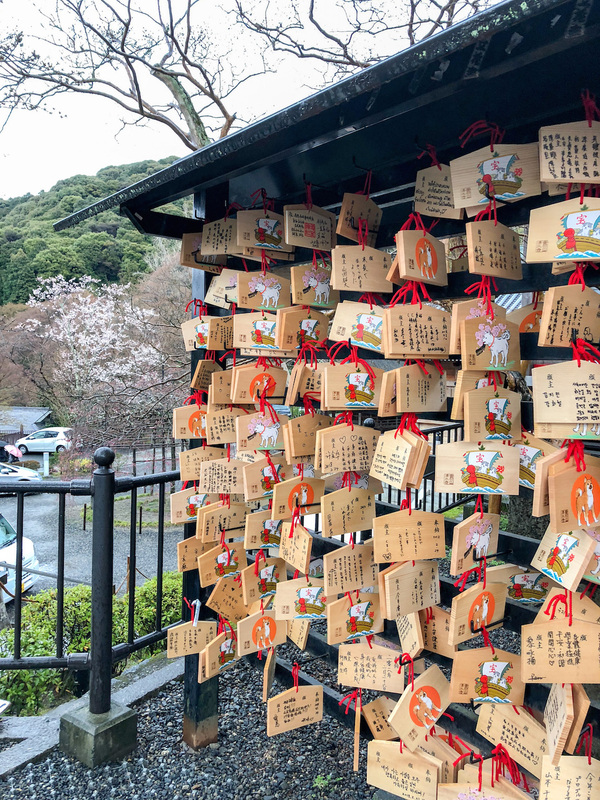 Or else, just hang out in the pretty little town of Arashiyama, eat all the delicious street food and walk through the Kimono forest. The Tenryu-ji Temple is right next to the Bamboo Grove, but I specifically did not suggest you visit it immediately after. 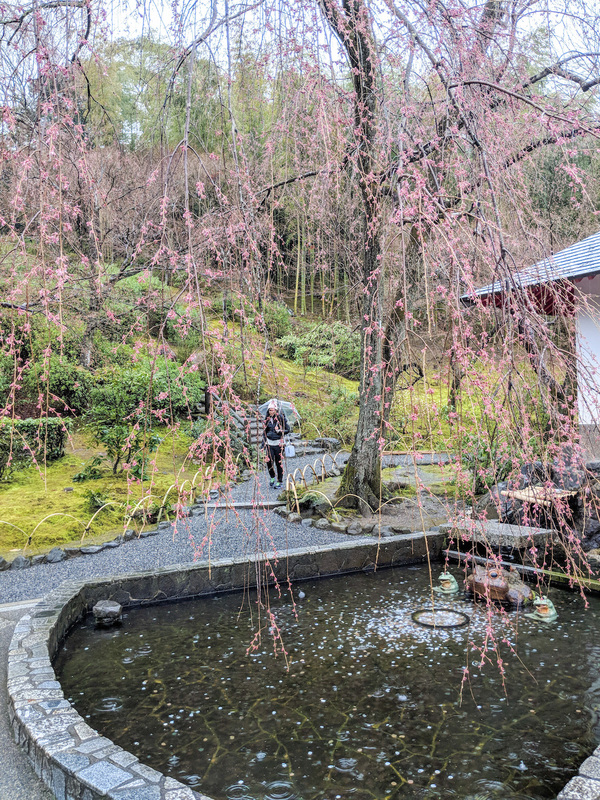 The reason is that I recommend you club your visit to the temple gardens with lunch at Shigetsu. This is a Michelin guide recommended restaurant serving vegetarian food set in the Tenryu-ji gardens! We did not get to eat there, but I would have loved to. Don’t forget to make reservations before you go. 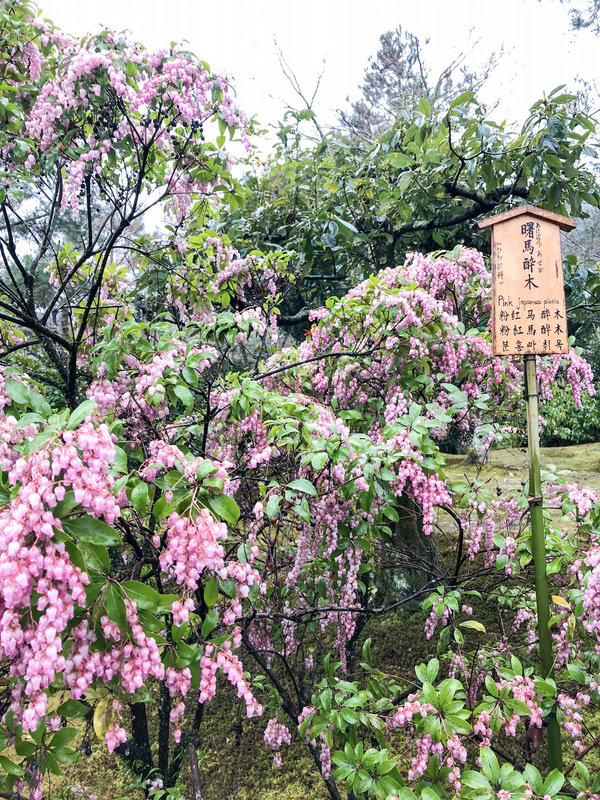 A walk in the beautiful flower garden after lunch would be a beautiful way to wind down your visit to Arashiyama! The gardens and temple have different tickets. We decided to go into the temple as well. If you go in the Spring or Winter, know that you have to take off your shoes, and floors are freezing! 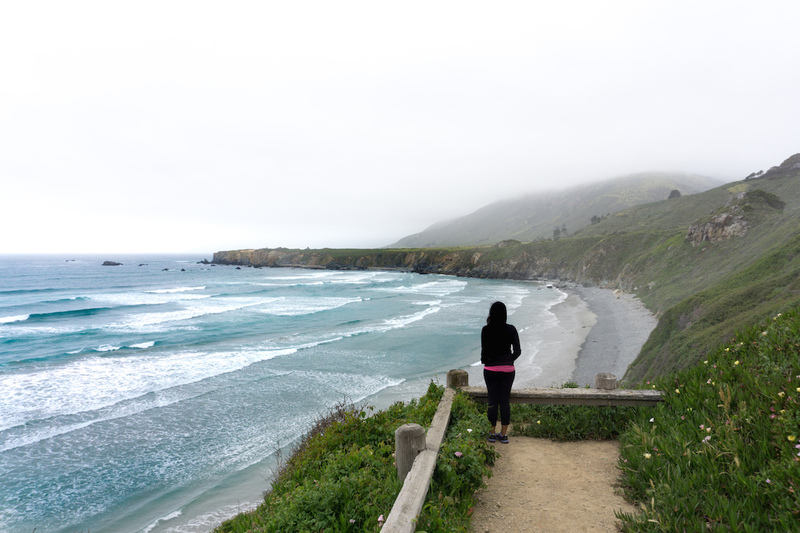 However, I think it’s still totally worth it for the sense of peace that will descend on you! It’s like a walking meditation. Oh and this picture postcard view is amazing too! 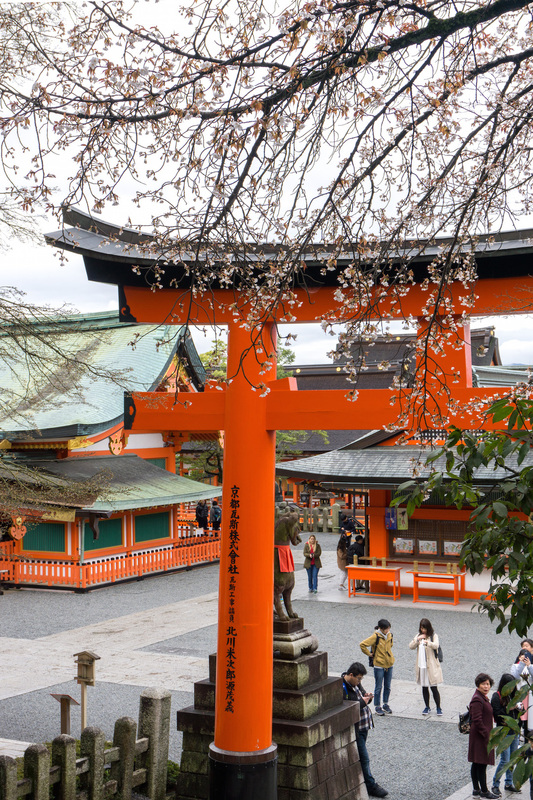 Once you are back in Kyoto, head to either the Golden Temple or the Silver Temple. You may not have the energy or time to see both, so choose wisely. Unfortunately, we never made it to either, but they were both on my list, so I hope you can visit at least one! 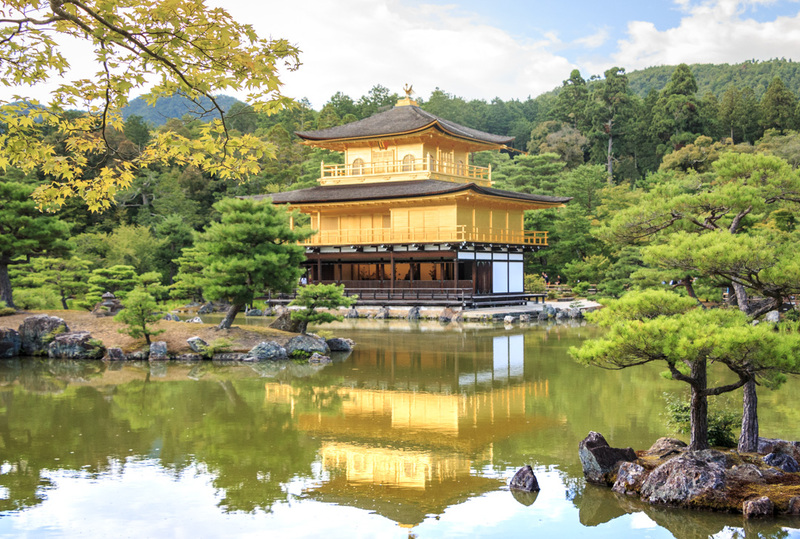 The Golden Temple, Kinkaku-ji, is a Zen-Buddhist temple originally built in 1397. The current building however was re-built in the 1950s due to a tragic fire. 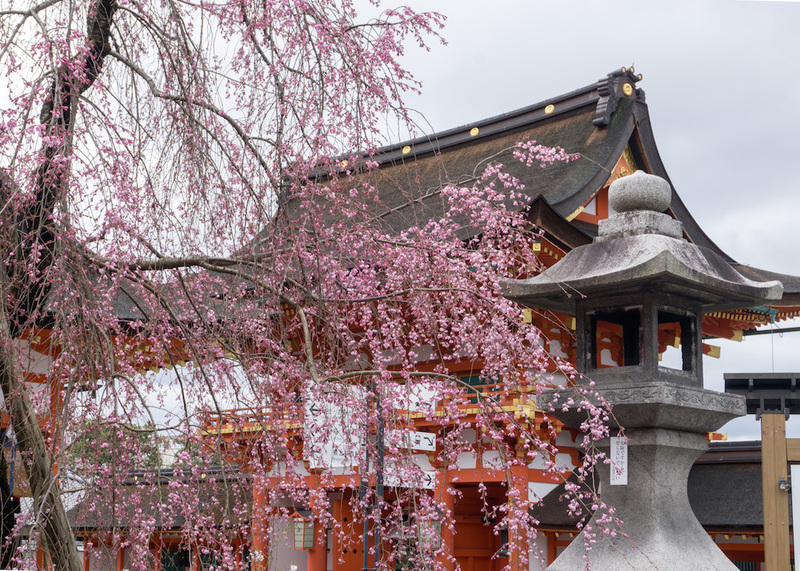 This is truly one of the most picturesque buildings in Japan! 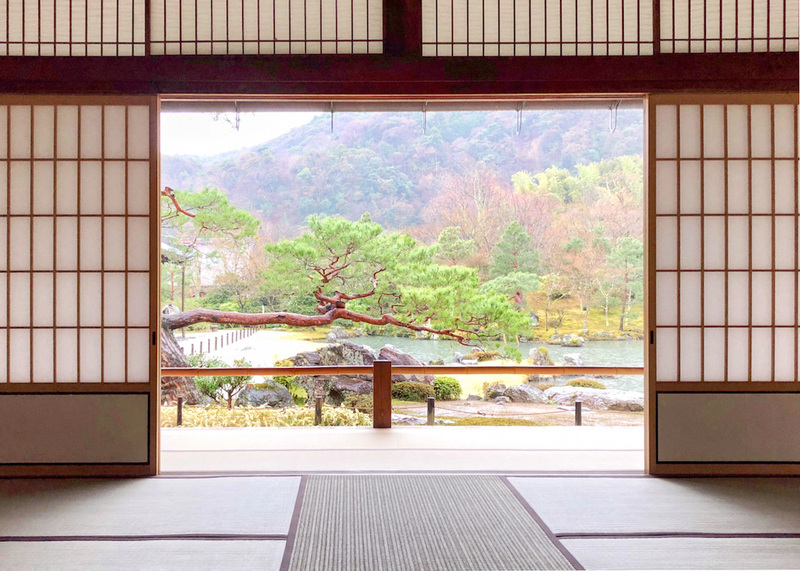 The postcard perfect picture below is by My Ticklefeet, and you can get more information on visiting Kinkaku-ji temple on their three day Kyoto itinerary. 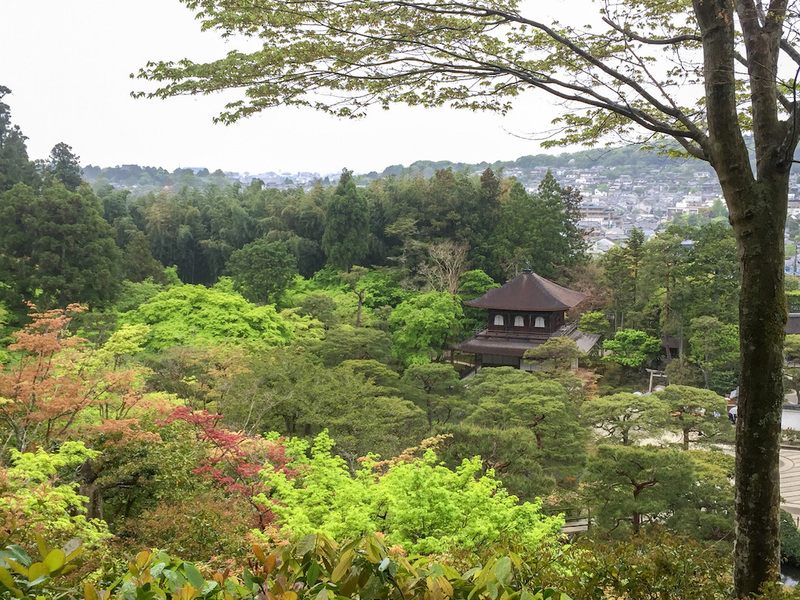 The Silver Pavillion, Ginkakuji, is set along Kyoto’s eastern mountains, Higashiyama. The name ‘silver’ seems to have arisen either in contrast to the ‘Golden’ temple, or due to the silvery light of the moon’s reflection on the pavillion. Either way, don’t head there expecting it to be made of silver. I think the best reason to visit Ginkakuji is as a starting point for a short one hour hike up Mt. Daimonji-yama. 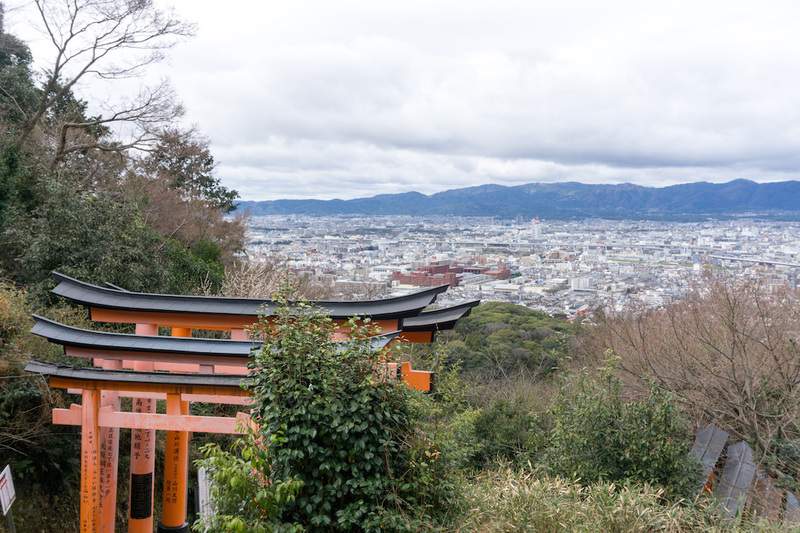 You can see incredible views of Kyoto from the top! 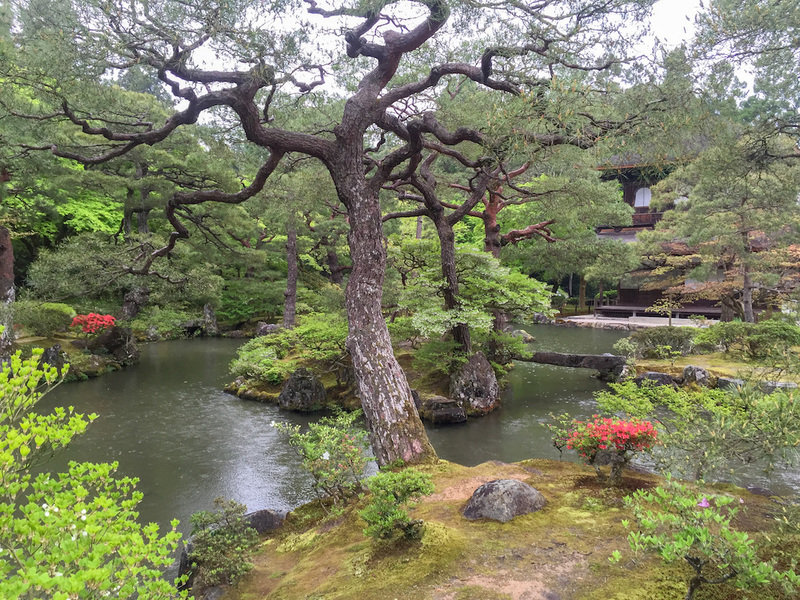 Thank you to Yolo Travel Experiences for sharing these lovely pictures of Ginkakuji! End your day with a well deserved drink! 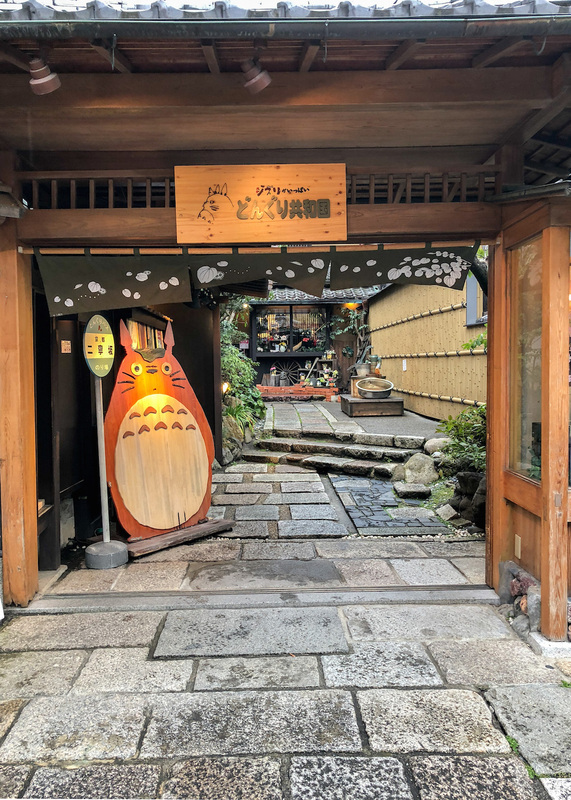 Kyoto has a ton of amazing bars. I highly recommend Bar Honami, on a quiet street in the City Center. Their private rooms for large groups are just so cozy! They specialize in whiskey, but we tried their hot sake too, which was delicious! 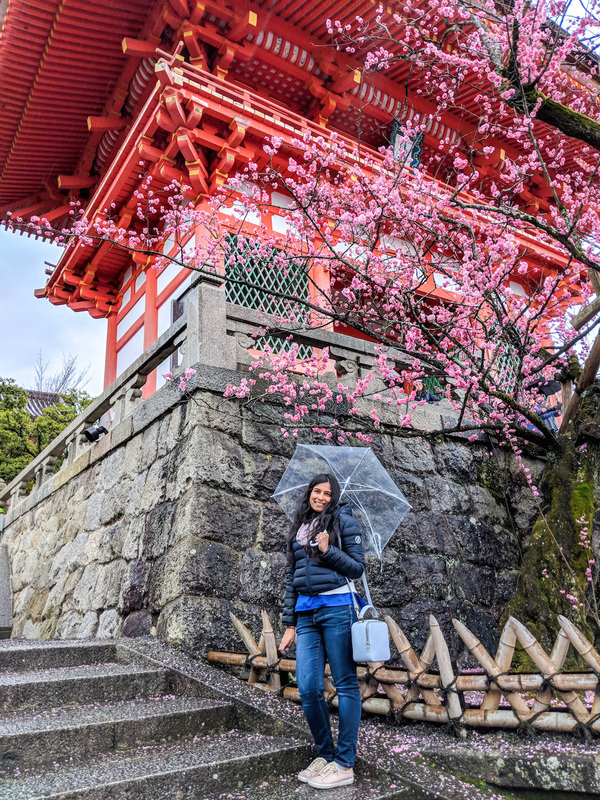 This is just a little taste of all there is to explore in Kyoto! We arrived in Kyoto on a rainy evening, a grim foreboding for the rain that was to be our constant companion while in Kyoto. However, we still managed to enjoy the city and can’t wait to go back! I truly wish we’d had more time – so I urge you to budget at least a day or two more. 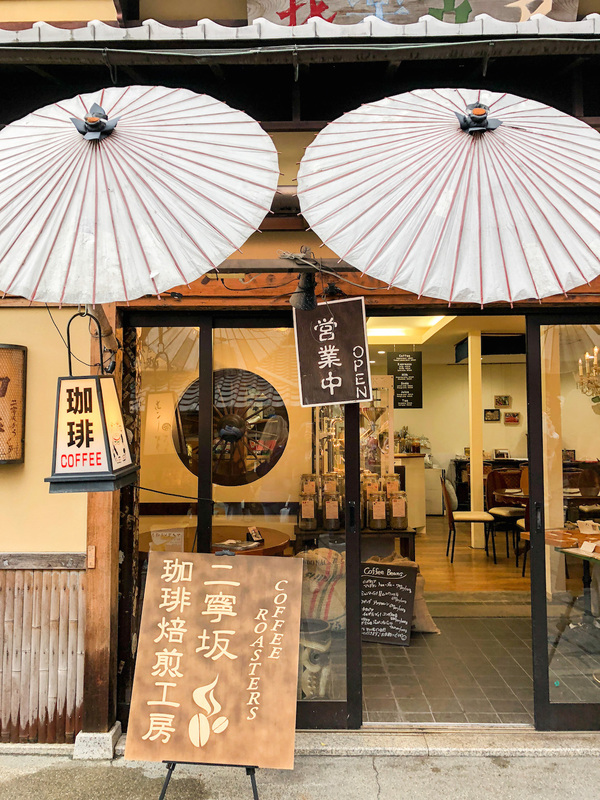 After you have your fill of Kyoto, you could make easy day trips to Nara (famous for free roaming deer) and Osaka (famous for Sumo wrestling and amazing street food). 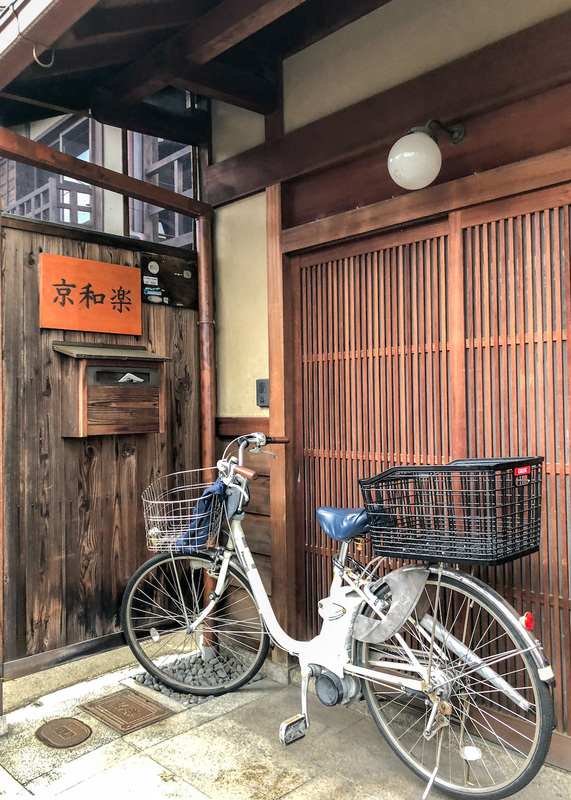 Where to Stay : Either stay near Kyoto Station for convenience, or in Higashiyama for an immersion in history and culture. 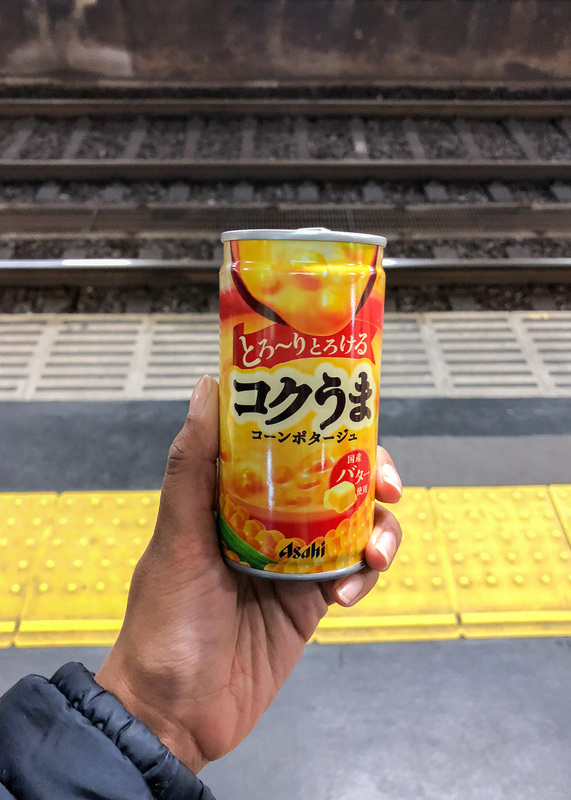 – I loved the can of corn soup you can buy from vending machines all over Kyoto. It’s a delicious savior from cold and hanger! 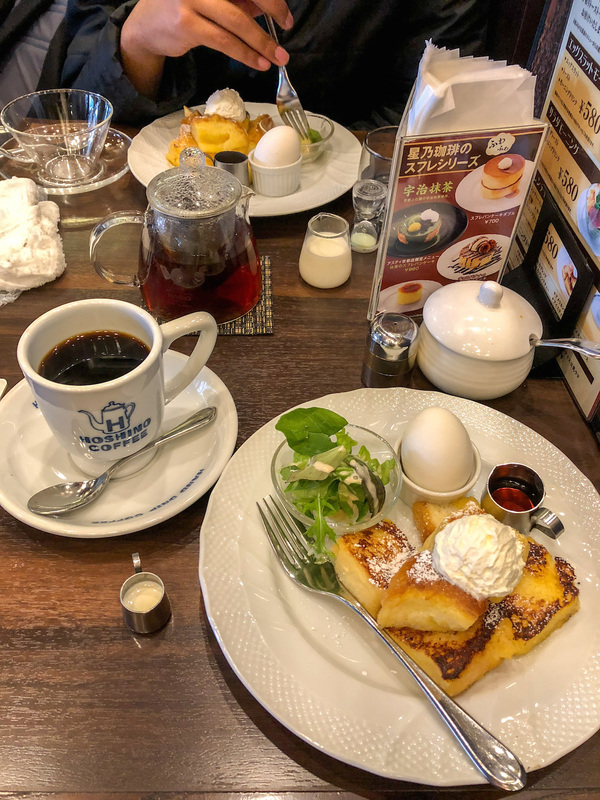 – For a quick breakfast, Hoshino Coffee at Kyoto Station has amazing french toast! 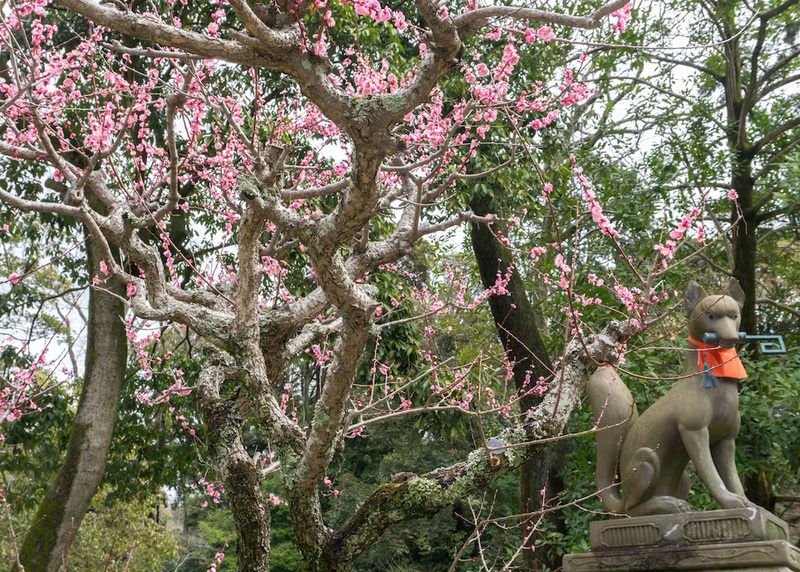 Possible Day Trips : Nara and Osaka are both possible as day trips from Kyoto. 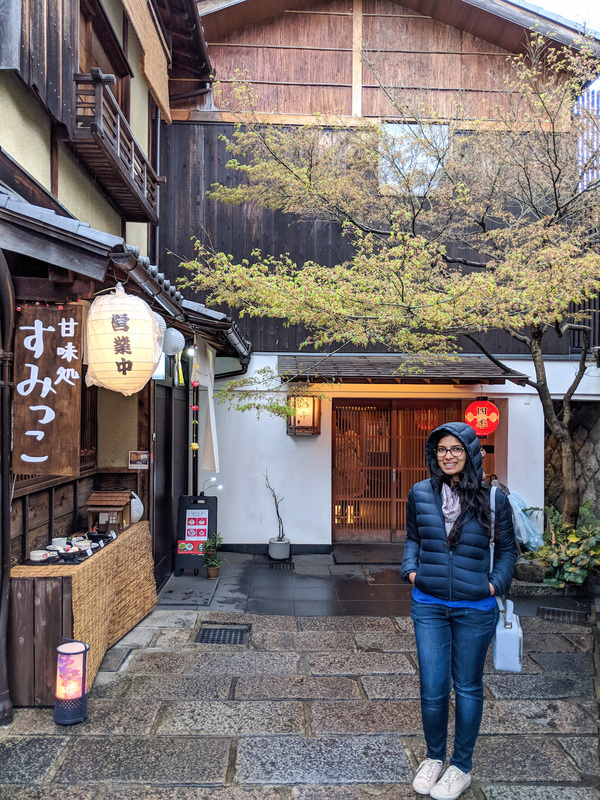 We literary didn’t see any of the things you mentioned during our day trip to Kyoto! 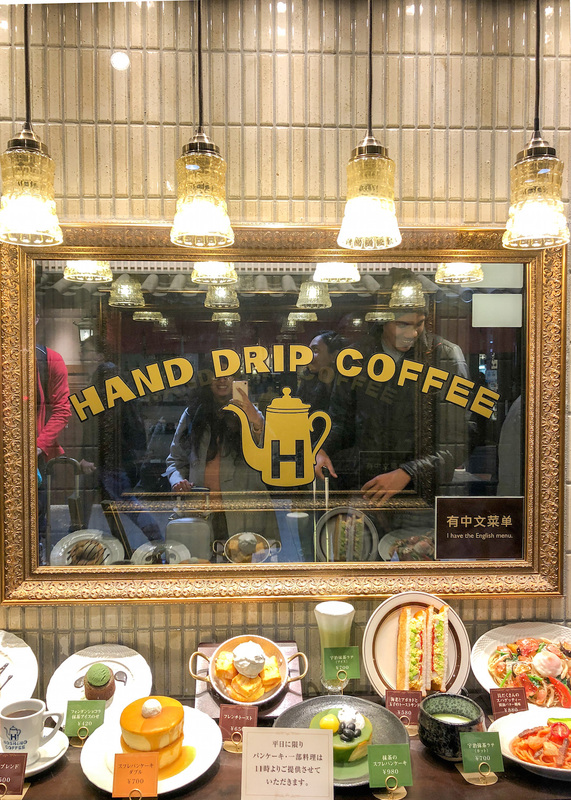 😀 I love how Japan is a heaven for coffee (like you) and tea (like me) lovers- finding the cutest cafe in an unexpected place is a normality there. Also, I love Japanese train stations with all its cool shops (hello, stationery! ), and that’s coming from a person who avoids shopping malls at any cost! 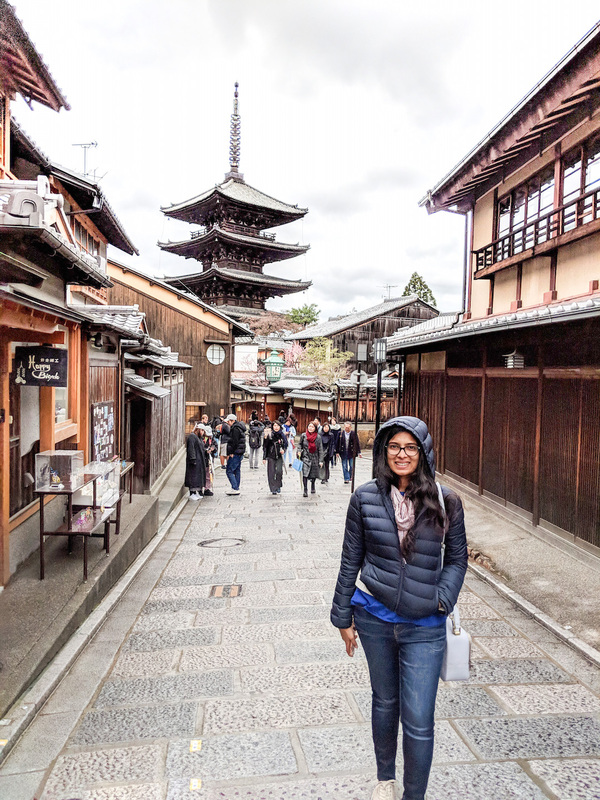 Your post is calling for a revisit to Kyoto! Hahah I need to head over to check out your Kyoto post now to see what you did 🙂 Miss the time when we had tea and coffee together in a cute cafe in Tokyo! Ahh I can’t wait to go back to Japan!